This compact precision parts washing system is well suited for a multitude of applications wherein precision cleaning for validation is required. Each processing chamber has its own transport elevator to take the work into and out of solution. The operator simply loads the platform and starts the cycle. The elevator automatically descends into solution and begins the first process. When complete the elevator ascends from solution with the basket(s). Leaning over the tank to manually place baskets in and out of solution is eliminated. The system includes patented RAMCO NFPA Floating Cylinders and a standard oscillation package using all NFPA components. Each step of the process is PLC controlled. 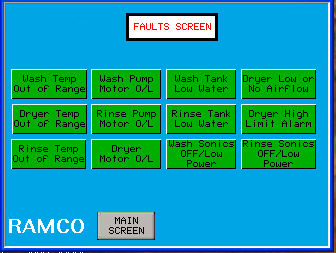 Key validation items are accurately monitored and any fault in the system immediately reported within the PLC program (see fault screen above) and with an external visual alarm (see top system picture). The process will not run when any fault is detected. 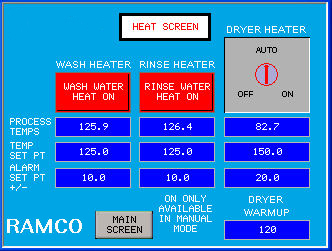 Temperature high and low limits, sonic power limits, and all points of machine functionality are monitored. The precision washing process consists of alternating cycles of agitation with turbulation and powerful ultrasonics. This pattern is repeated. Following precision washing the parts are transferred to the rinse stage. The rinse process also includes alternating cycles of agitation with turbulation and powerful ultrasonics. This pattern is repeated. Following rinsing the parts are transferred to the hot air knife dryer. 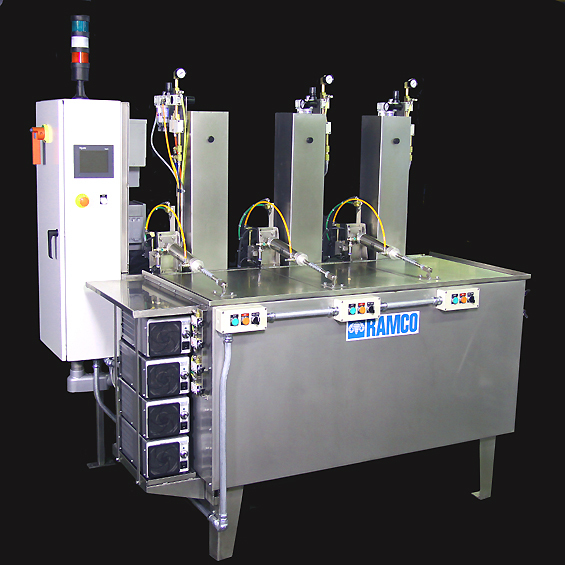 The unique RAMCO ultrasonic system cascades powerful sweep frequency (between 38 to 42 kHz) ultrasonics with our standard turbo/filter/agitation washing. Using mechanical agitation washing to remove gross contamination and ultrasonic cleaning to remove finer and/or more resistive deposits is a very effective processing routine. The steps are sequenced with dual digital cascading timers for agitation washing before (or after) the ultrasonic cleaning phase. Our MultipleRollover feature repeats the dual mode process for any number of preset “rollovers”. The results are faster and more effective cleaning. The ultrasonic stage can be set to provide vertical oscillation of the work during the cycle. A selector switch can be provided for static ultrasonic or oscillating ultrasonic modes. This option provides a superior ultrasonic washing action over conventional systems by moving the work through the peaks and nodes of the wave energy. Following precision washing the parts are transferred to the rinse stage. Again the operator simply make the transfer and press the start button. 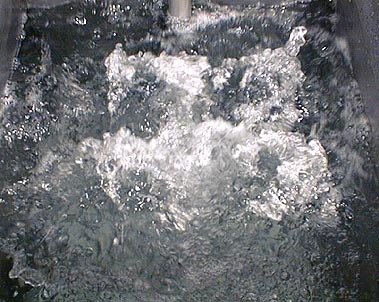 The rinse process also includes alternating cycles of agitation with turbulation and powerful ultrasonics. This pattern is repeated. Following rinsing the parts are transferred to the hot air knife dryer. These systems are ideal for a small cells.